Have you ever been disappointed when the secret behind a magic trick was revealed to you? At first you were amazed when the trick was performed. It’s amazing to see a skilled magician executing a trick so perfectly you can’t imagine how he did it, except by some form of magic. For instance, I always thought the David Blaine levitation trick was just amazing. He just lifted up off the ground. But, from a different angle you could see he’s just lifting his body with the front of one foot while keeping his heels together. From the back you can’t see that foot and the trick looks amazing. And, as long as you don’t know the trick, it does look amazing. And, when used with skill, it makes the performer look, well, magical. There’re a lot of these tricks in marketing. There are tricks that get stated so many times few even understand what they mean anymore. Someone says it and you totally ignore them, because you’ve heard it before and seen it so many times. However, this is a trick so powerful, that when you use it with a little skill, the results can be transformational for your membership marketing efforts. Promote benefits, not features. To take this strategy to another level, give your prospective members the opportunity to be a hero in their story by joining your membership. Murray Bradford owns the Bradford Tax Institute. Through the institute, Murray produces thousands of tax reduction strategies written in layman’s terms, so any business owner can use them. Plus, everything is annotated so professionals can look-up the law to satisfy themselves that the tax strategy is appropriate. The sad fact is, if you pay someone to prepare your tax return, more than likely, that person is more interested in protecting himself from problems than he is interested in saving you money. He gets paid whether you pay too much in tax or not. There’s little incentive to do the extra work necessary to find you extra savings. Therefore, while it would certainly pay you to get your own membership in the Bradford Tax Institute to identify ways you can structure your business to save yourself thousands in taxes, my first project with Murray Bradford was to market his membership program to tax preparers. So, how do you market a course that teaches tax savings opportunities to a population of analytical accountants, many of whom have been preparing returns for decades and think they know everything they need to know already? There are thousands of articles, all written in layman’s terms to make it easy for your clients to follow, each are updated to ensure compliance with the law. And, you could save your clients a lot of money! Sounds like a lot of work, doesn’t it? The trick is to not talk about what you deliver and instead focus on how what you deliver can make your member the hero of his own story. Murray is a tremendous copywriter. He used a couple of samples I gave him to create a fantastic video sales letter that promotes the life-changing opportunity that tax preparers can experience when they get access to his site. 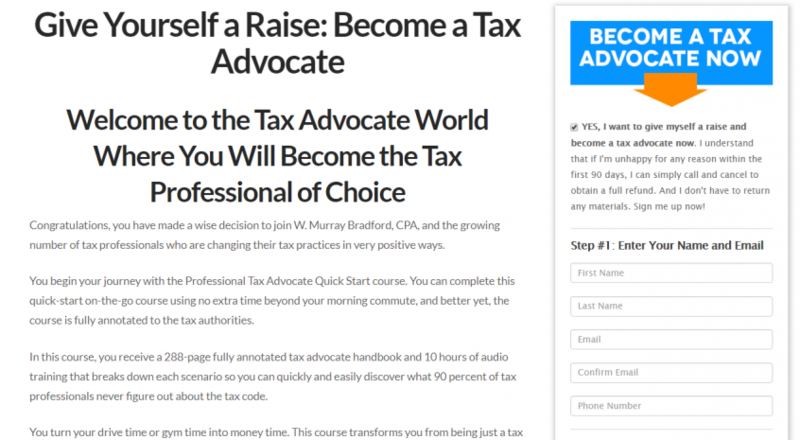 Rather than promoting all the articles and tools available on the site, Murray describes how the prospective member can transform from being a tax preparer (competing with big corporations offering cheap services, free online services and the sister-in-law working from her kitchen table) to a tax advocate, free from competition. The video promotes the life of the tax advocate, how clients come to you, refer their friends and appreciate the work you do. While as a tax preparer, clients only begrudgingly pay your bill, usually months late. See the trick revealed? Is it impressive, or does it sound mundane? The trick is to figure out how your membership can positively change your prospective members’ lives. Then, sell this change and the positive impact of this change more so than your product. With a little skill, this trick can create magical results for your membership. Here’s another thing we did with this marketing promotion. In the past, you could join Bradford Tax Institute for $49.00 monthly membership. Instead, we packaged an annual membership together with his tax course to create a $750.00 front-end offer. Now, when Murray gets a tax preparer excited to join, he generates a lot more cash. This provides fuel for increased marketing investments. Getting the attention of your prospects is damn hard today. When you do all the work necessary to get your prospect to pay attention, it’s best to make a big sale rather than a small sale. The hard work has already been done.